Mexican wedding cookies are traditionally given as wedding favors wrapped in white fancy paper. This favorite holiday cookie also goes by many different names. Some call them snowballs, Russian teacakes, or Swedish teacakes. The names may be different but the cookie is basically the same. Mexican wedding cookies can also vary by the type of nuts that are used. I use pecans, but walnuts and almonds can be substituted. So don’t wait for a wedding to try these easy to make cookies. Try them during the next holiday season for a festive treat. They make a great Christmas cookie. Toasting the pecans will add a nice rich flavor to these cookies so I highly recommend you do this step. Preheat oven to 350 degrees F. Place the pecans on a cookie sheet in a single layer and bake for 6 – 8 minutes or until they are lightly browned and fragrant. Allow them to cool. In a medium size bowl or kitchen aid which is what I use, cream the butter, vanilla and almond extracts together. Add the powdered sugar and mix in. Add the flour a little at a time until it is fully blended in. When the pecans are cool, place them in food processor or chop with a knife until they are fairly fine. Measure 1 cup of finely chopped pecans. Chill dough in the refrigerator for at least 1 hour and then shape into 1 inch balls with your fingers. Place on an ungreased cookie sheet 1 to 2 inches apart. Bake in a preheated 350 degree F oven for 12 – 15 minutes or until lightly golden brown on the bottom. Cool on a wire rack. Roll the cookies in powdered sugar so they look like snowballs. I like to sift more powdered sugar over the top at the end, as some of the sugar may absorb into the cookie and not be as white. When completely cooled store in an airtight container. 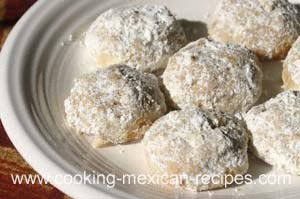 Remember, mexican wedding cookies are a delicious dessert anytime of year.